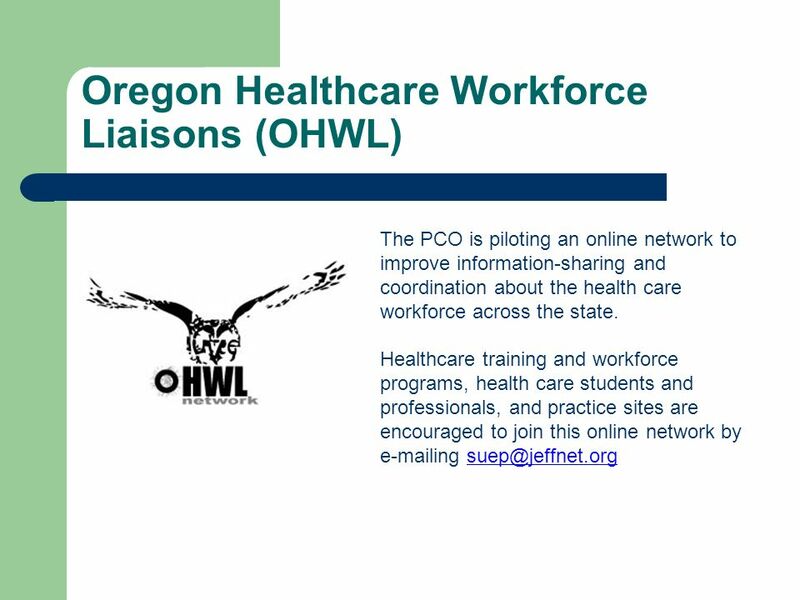 Primary Care Career Opportunities in Oregon Filling a Fundamental Need in Healthcare. 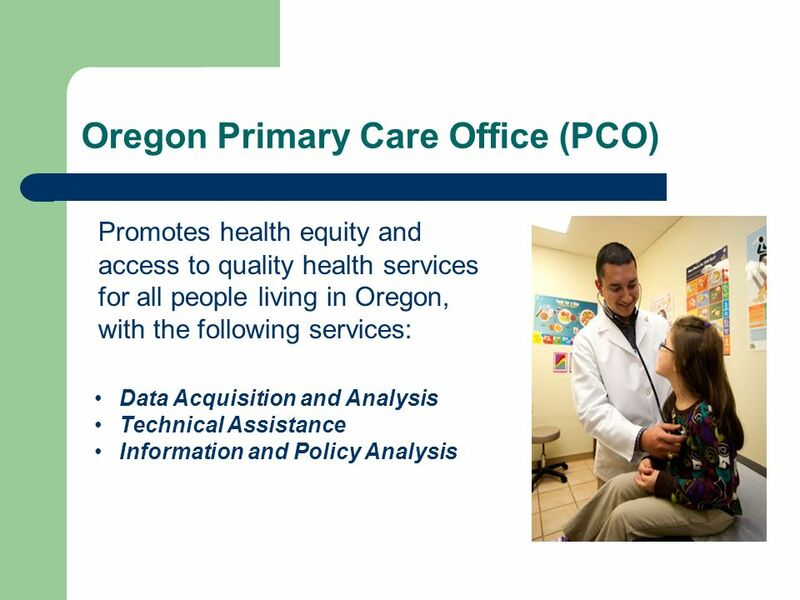 4 What is primary care? 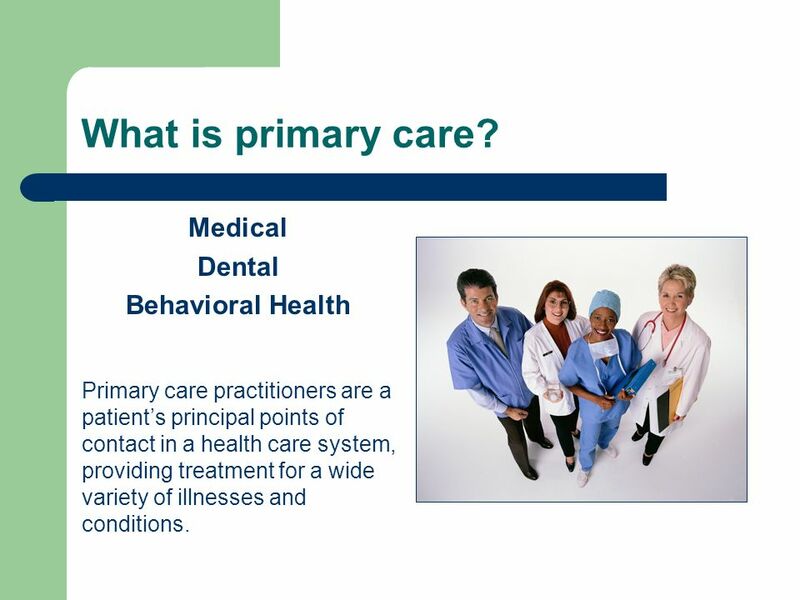 Medical Dental Behavioral Health Primary care practitioners are a patients principal points of contact in a health care system, providing treatment for a wide variety of illnesses and conditions. 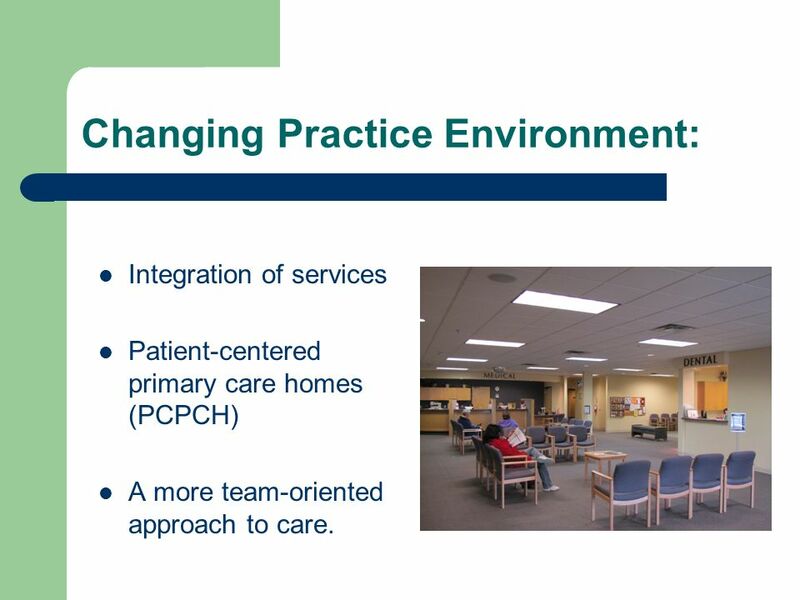 5 Changing Practice Environment: Integration of services Patient-centered primary care homes (PCPCH) A more team-oriented approach to care. 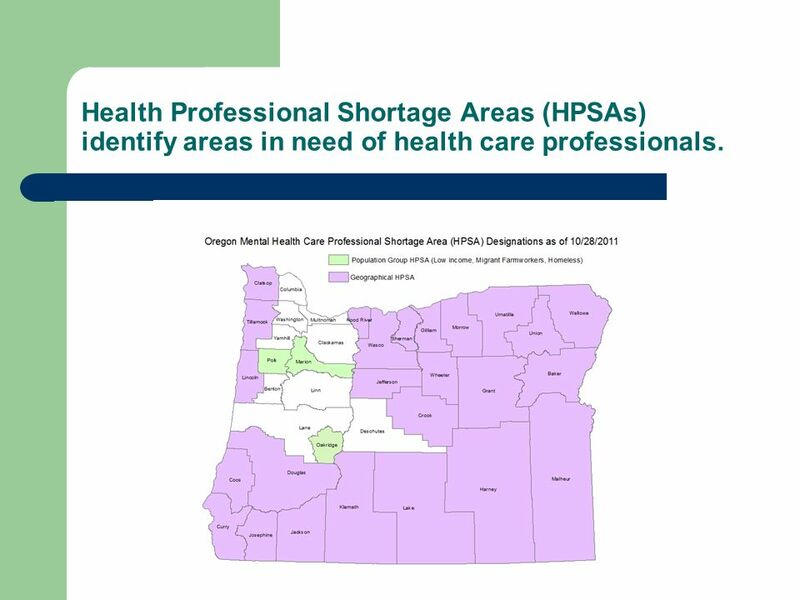 9 Health Professional Shortage Areas (HPSAs) identify areas in need of health care professionals. 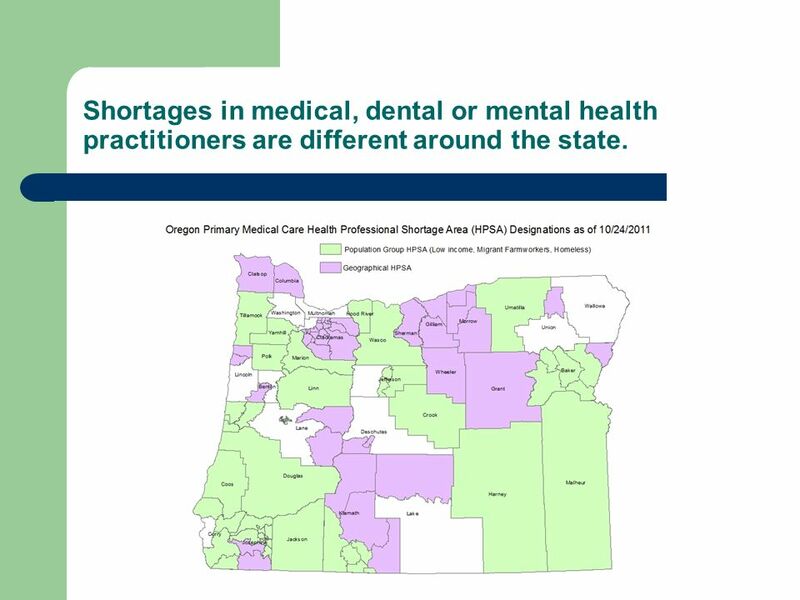 10 Shortages in medical, dental or mental health practitioners are different around the state. 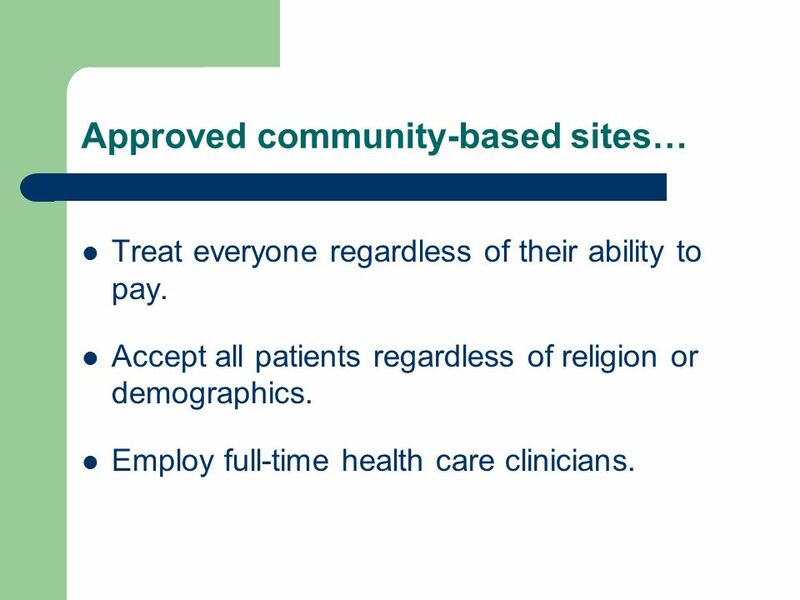 12 Approved community-based sites… Treat everyone regardless of their ability to pay. Accept all patients regardless of religion or demographics. 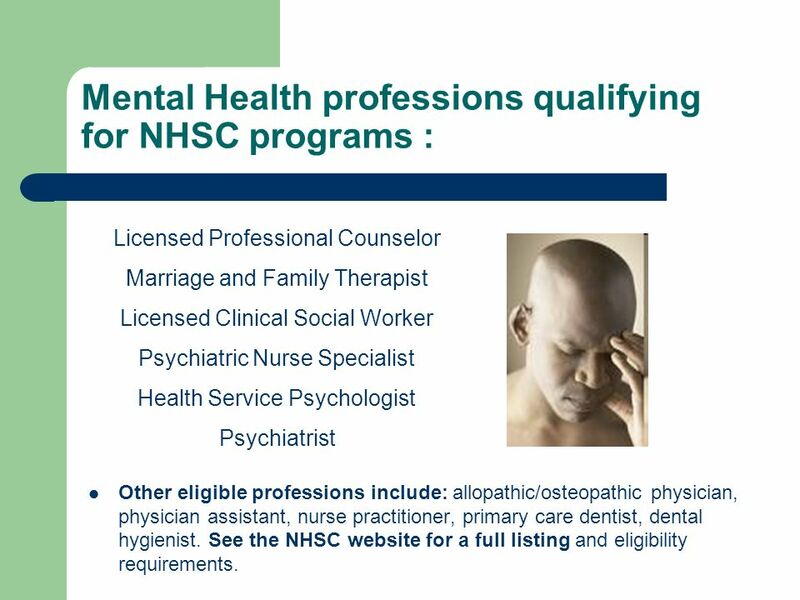 Employ full-time health care clinicians. 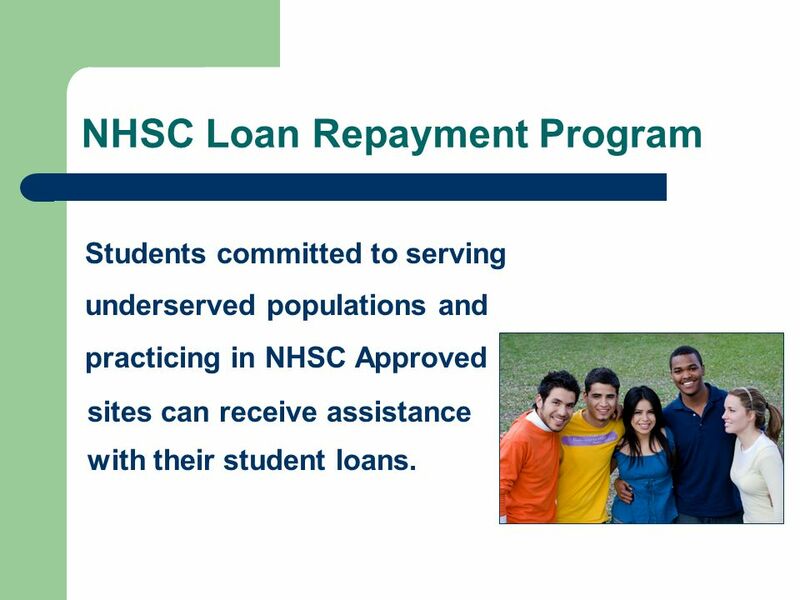 13 NHSC Loan Repayment Program Students committed to serving underserved populations and practicing in NHSC Approved sites can receive assistance with their student loans. 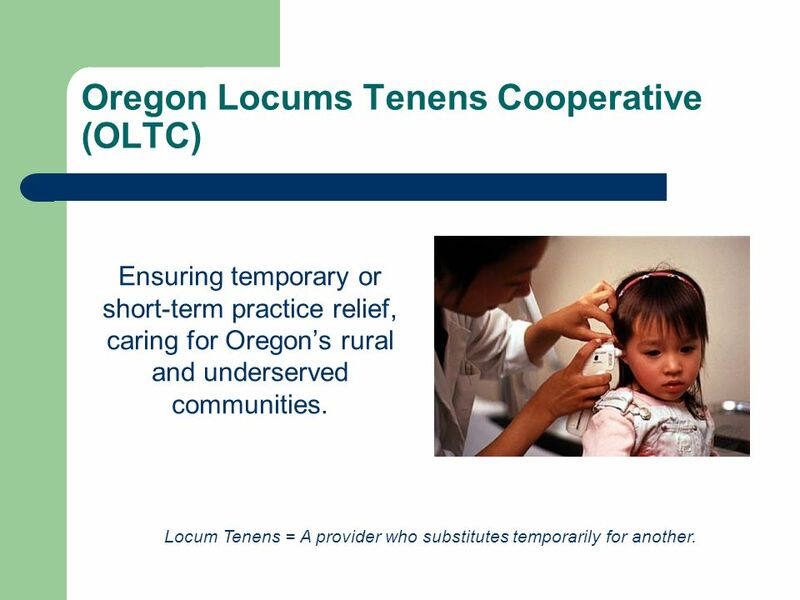 17 Oregon Locums Tenens Cooperative (OLTC) Ensuring temporary or short-term practice relief, caring for Oregons rural and underserved communities. 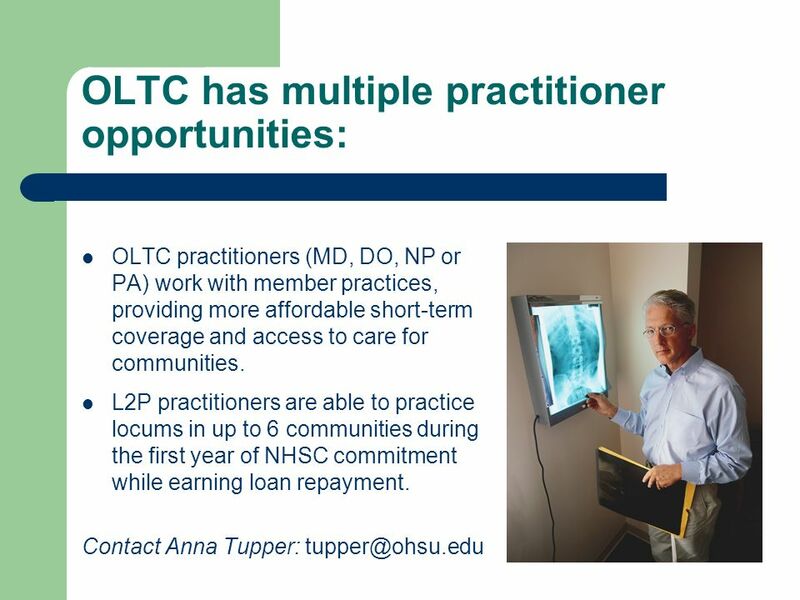 Locum Tenens = A provider who substitutes temporarily for another. 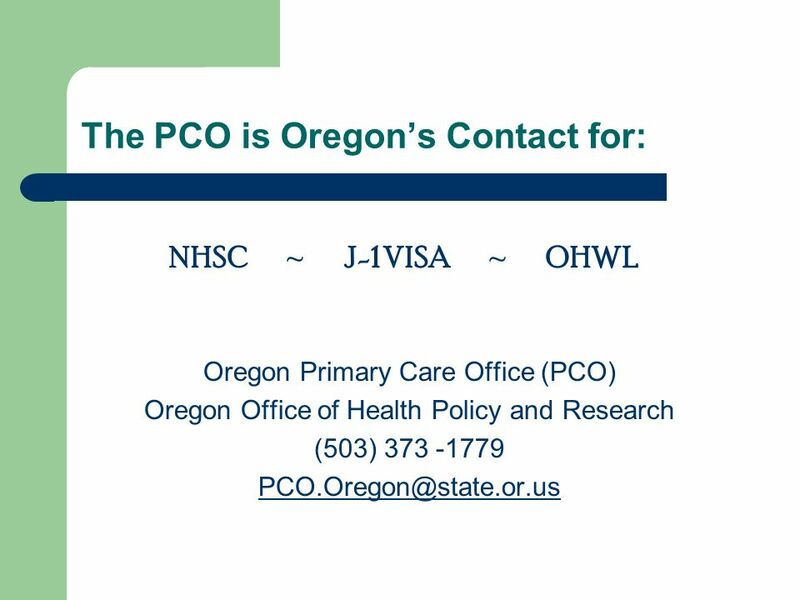 Download ppt "Primary Care Career Opportunities in Oregon Filling a Fundamental Need in Healthcare." NATIONAL HEALTH SERVICE CORPS 1. 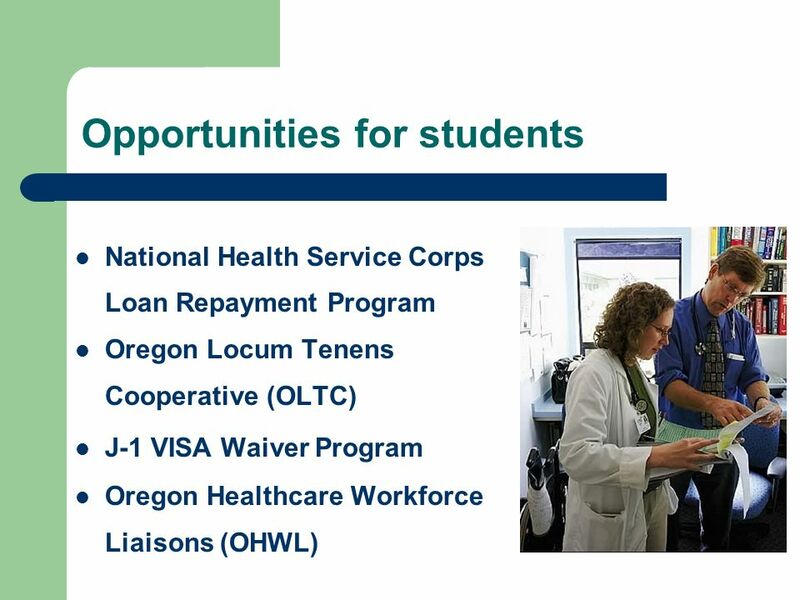 AGENDA 2 Overview of the National Health Service Corps Loan repayment program Scholarship program NHSC-approved sites. 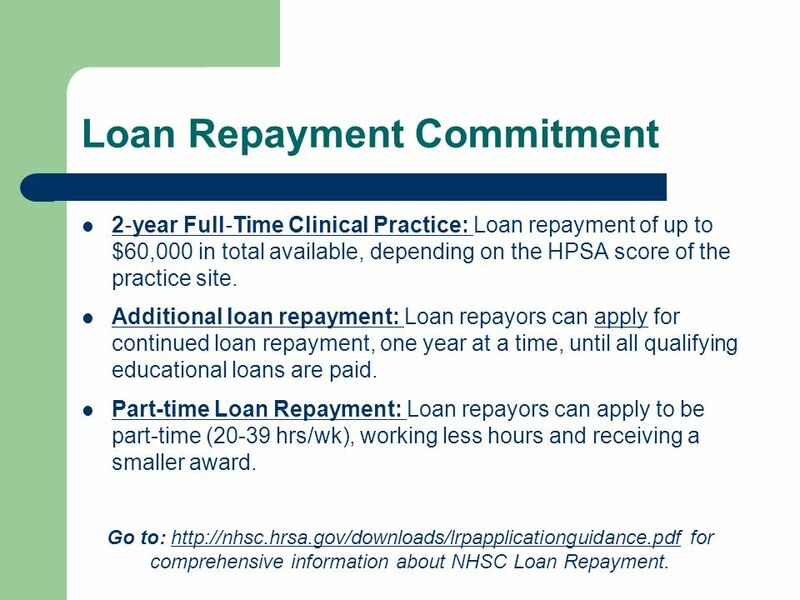 Health Resources and Services Administration (HRSA) The National Health Service Corps and Other Federal Scholarship and Loan Repayment Opportunities for. NURSE Corps Caring for Communities in need nursecorps/index.html nursecorps/index.html. AHEC-PCO-PCA Relations A How-To on Managing Relationships and Utilizing Resources National AHEC Organization June 2010 Las Vegas, NV Joan Bohlke, Workforce. 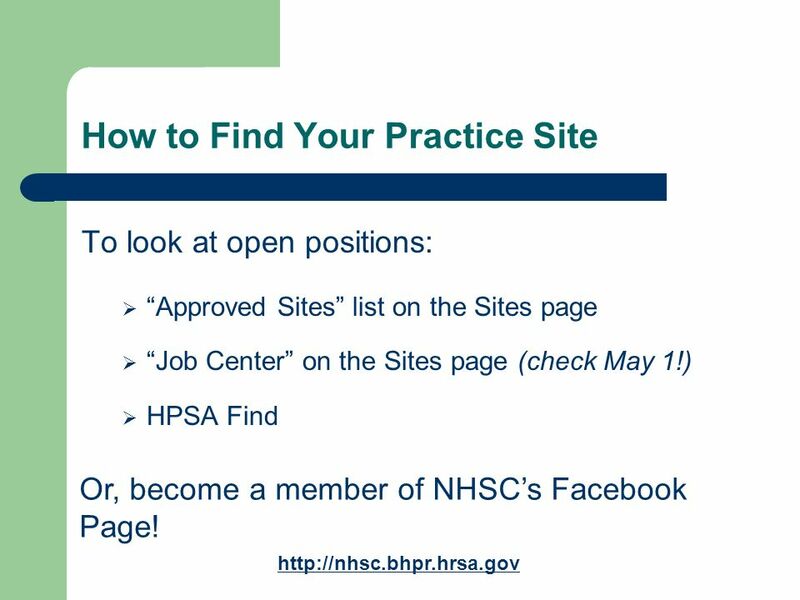 Shortage Designations HPSA Health Professional Shortage Area MUA/P Medically Underserved Area/Population What are they: A way to identify areas of greatest. 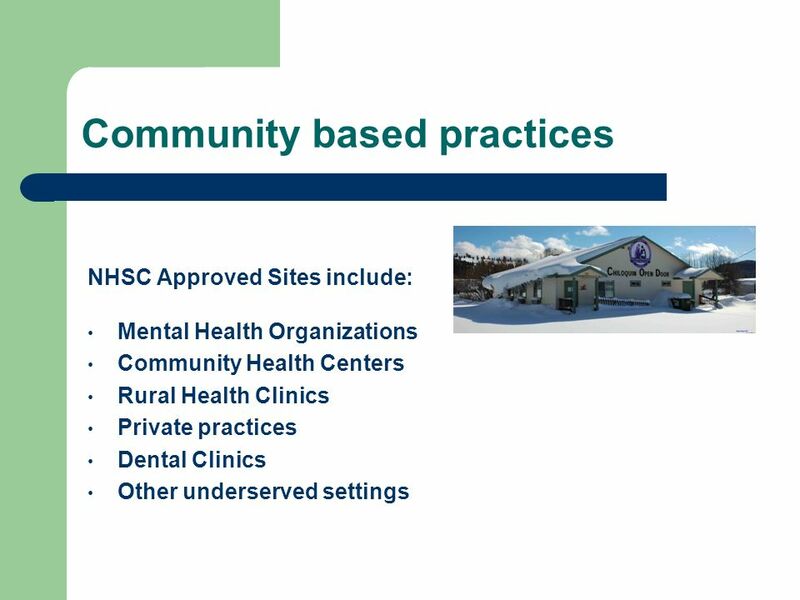 Community Health Center Benefits Grant Funded Health Centers & Look-Alikes. 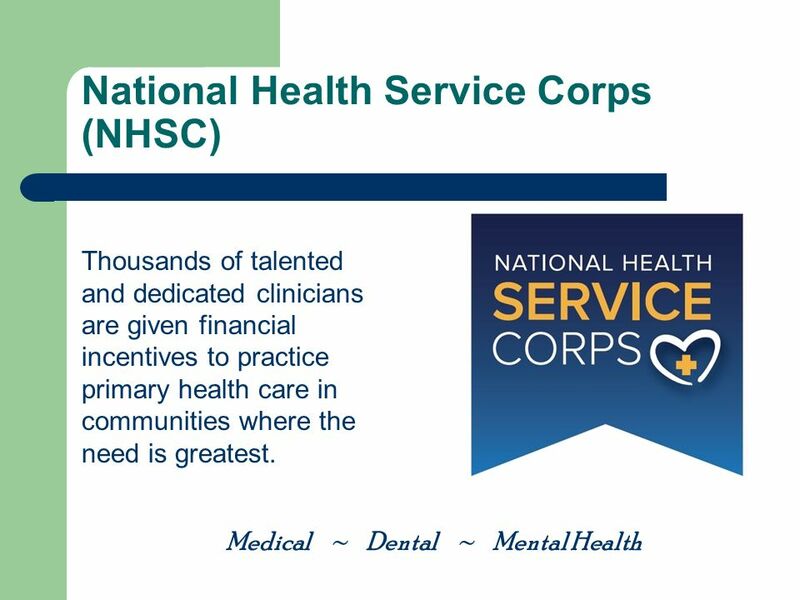 THE NATIONAL HEALTH SERVICE CORPS (NHSC) builds healthy communities by supporting qualified health care providers dedicated to working in areas of the. 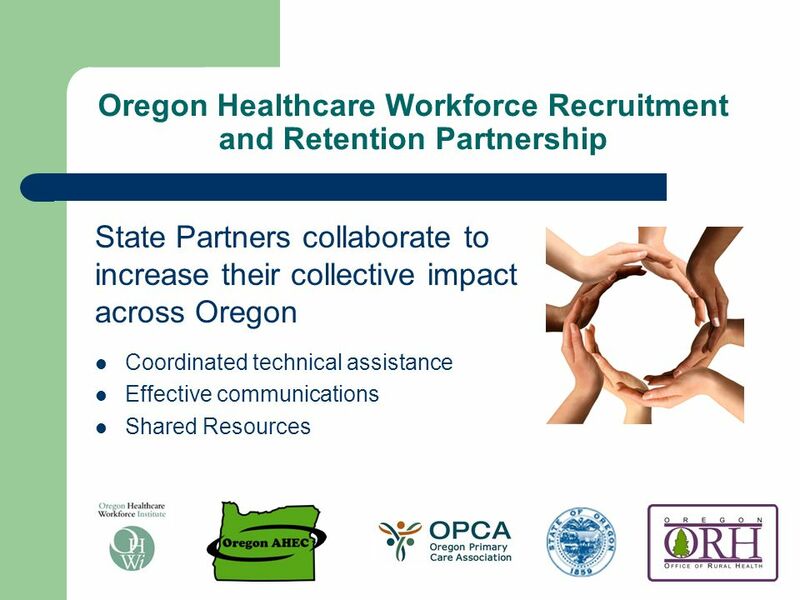 Our Vision - Healthy Kansans living in safe and sustainable environments Workforce Recruitment and Retention Programs Robert Stiles Barbara Huske Primary. Current Workforce Development Efforts and Issues for Consideration for California's Section 1115 Waiver Renewal November 20, 2014 Sergio Aguilar, Senior. 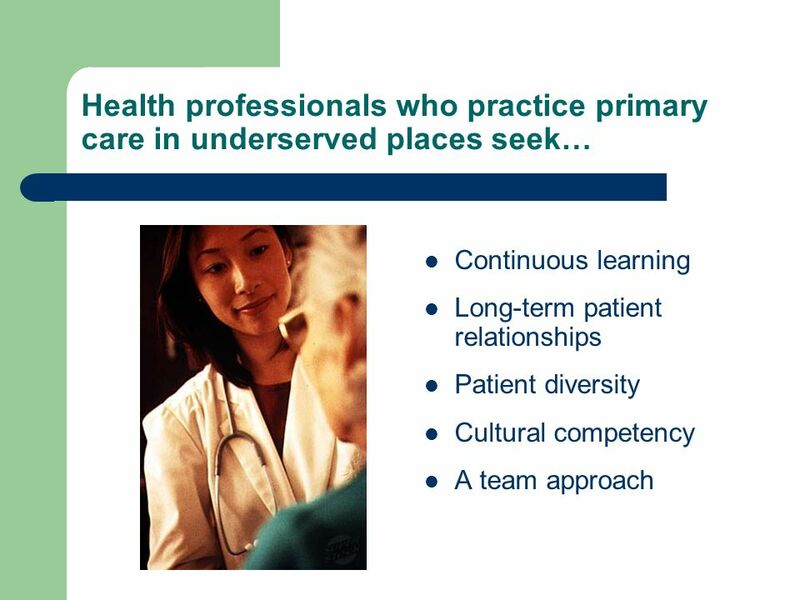 The Office of Primary Care and Rural Health is a health resource for Utah's rural, underserved communities. The Office coordinates federal, state, and. Partnering for Healthy Communities Since 1973 NC SCHOOL COMMUNITY HEALTH ALLIANCE Annual Meeting December 4, 2012. Area Health Education Centers (AHEC) Program Louis Coccodrilli, MPH Chief, AHEC Branch Department of Health and Human Services Health Resources and Services. 2013 NC PRIMARY CARE CONFERENCE CHARLOTTE, NORTH CAROLINA JUNE 20-22, 2013 JERRY BOYLAN NC OFFICE OF RURAL HEALTH & COMMUNITY CARE PLACEMENT SPECIALIST. HF 211- LOAN FORGIVENESS EXPANSION. WORKFORCE COMMISSION FINDINGS: Rural areas in Minnesota face a variety of challenges to attract and retain health. Access to Care Healthy Kansans 2010 Steering Committee Meeting May 12, 2005. Health Resources and Services Administration (HRSA) Federal Scholarship and Loan Repayment Opportunities for Health Professionals W. Gary Hlady, MD, MS.
Health Care Workforce Considerations for California’s 1115 Waiver Renewal Sunita Mutha, MD, Joanne Spetz, PhD, Janet Coffman, PhD, and Margaret Fix, MPH. Workforce Training Initiatives in Other States’ Medicaid 1115 Waiver Applications Sunita Mutha, MD, Joanne Spetz, PhD, Janet Coffman, PhD, and Margaret. 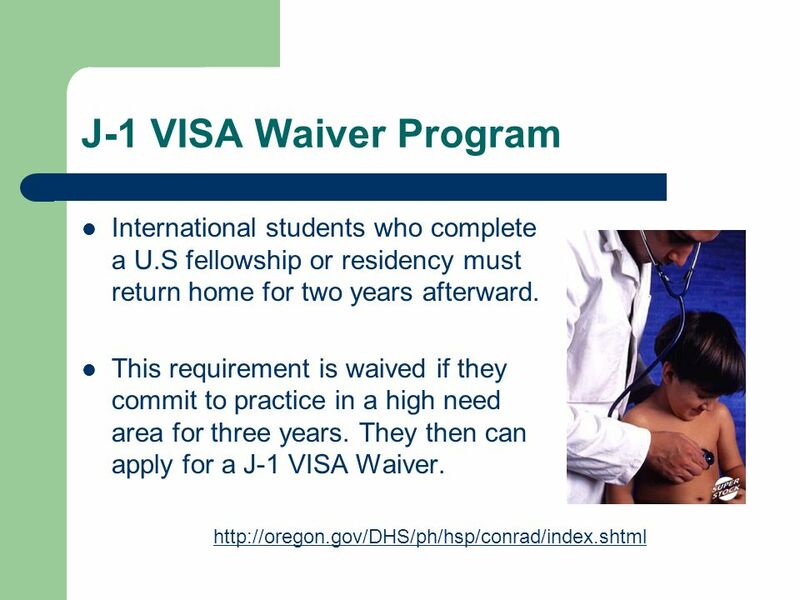 The National Health Service Corps and Other Federal Scholarship and Loan Repayment Opportunities for Primary Care Clinicians in the US-Associated Pacific.